This nine-day retreat in India combines Emil's deep yogic work with an opportunity to meet extraordinary adepts and artists of the Yogic path. Morning sessions of classical Indian music, meditation and Pranayama will be followed by an Asana session that is shared by beautiful Yogini Anouk Aoun. The afternoons are an immersion into Indian philosophy, details of the yogic processes of breath, Mantra and Mudra, all guided by Emil. A pre-dawn Mantra recital and contemplative moment is shared with professional musicians - Vidya Rao, the Indian Thumri singer, plans to join us again. She is a phenomenal musician and artist (see www.vidyaraosinger.com). Finally, the afternoons and evenings from Friday to Sunday bring us into a conversation with adepts of the yogic world: a group of extraordinary personalities will be presenting their life story, and open up to interaction with us. Besides Vidya Rao the lineage holder of Chöd, Machig Rinpoche, will again grace us with his presence. Several more adepts will join us for this weekend. Please keep in contact for the details! Retreat and Conversations will be held at the Satsanga Retreat Centre with its magnificent Nataraja Yoga Hall (see www.satsangaretreat.com). The resident chef and her kitchen team will prepare pure ayurvedic / yogic meals for us. 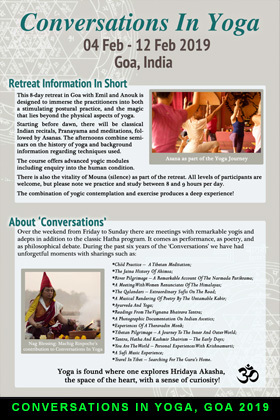 For some more information please see the flyer Conversations In Yoga, Goa 2019 in the column to the left here. This retreat fills rather quickly, we suggest to book as early as possible to secure a place. March/April 2018: Yoga Pranala TT Level 1 in Ubud-Bali with dates 22 March - 13 April. June 2018: Philosophy for Level 1 training course for Yoga Energetics in Bali-Ubud. July 2018: A 3-day 'History of Yoga' series at USADA in Ubud - please enquire for details. July 2018: The dates for the yearly training with Yoga Arts in Ubud-Bali are 30 Jun - 27 July. Emil teaches here in the latter half. August 2018: A second foundation-level TT with Pranala is held at the Ananda Cottages at Ubud-Bali, from 26 July - 17 August. End of Aug/Sep 2018: In Europe for workshops. Please enquire for more details. Confirmed are the weekend workshops in Liechtenstein (26/26 Aug), Oxford (08-09 Sep) and Brighton (exact dates tba), as well as the Retreat in Oedemühle near Salzburg (held from 29 Aug - 02 Sep, for this retreat, please see details below). October 2018: Pranayama and Philosophy workshops in Tokyo from 20 - 26 October. November 2018: Philosophy and Pranayama modules in the Pranala Level 2 training that takes place from 01 - 30 November at the venue 'Under The Banyan' in Ubud. December 2018: The yearly Level 2 Teacher Training with Brahmani Yoga/Julie Martin in Goa is set with dates from 02 - 29 December. See below for the entire information! December 2018: And finally, a guest lecture at Anouk Aoun/Daniela Wolff's 'Yoga and Ayurveda' retreat at the Satsanga Retreat Centre in Goa, held from 22 - 29 December. Please contact emilewendel@gmail.com for further information regarding these programs in 2018. This retreat is designed to immerse the practitioners into both a stimulating postural practice, and the magic that lies beyond the physical aspects of Yoga. We start early with pre-dawn meditation and Pranayama, followed by a 2 hrs Asana sequence. Postures are taught by the lovely Anouk Aoun, and are presented on levels that do justice to both established and developing Hatha practitioners. Also part of it is the practice of Mouna (silence) during the mornings. The afternoons introduce a topic of the day (Mantras or Mudras), and yogic philosophy, which will focus on the Hathayoga-Pradipika and its importance for the development of modern yoga. This workshop is enriched with music performed by the beautiful presence of Mino Vergnaghi. He will open the early morning meditations, and lead a sound therapy in the afternoon. As of 30 May 2018 there are only 4 places available in this Salzburg retreat. This is a teacher training course designed for those that have experience in teaching beginning levels of Yoga and wish to continue learning. The training is co-taught by Emil and the advanced Yogini and teacher trainer Julie Martin, director of Brahmani Yoga, and joined by Dr. med Rhys Beynon with his delightful skills to integrate medical knowledge and Yoga practice. It is a full-time 300hrs intensive course that makes up to Yoga Alliance 500 certification at successful completion. 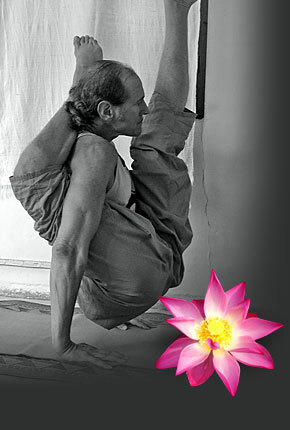 The fees include accommodation and a daily yogic diet prepared by the chefs of our host hotel, Satsanga Retreat Centre. Please note: This particular training requires a good measure of pre-course work - do apply well ahead.